There’s a lot of folk happening this week. But shake the snow of your shoes by dancing up a storm to the Celtic fire of Edmonton Celtic Rock band The Derina Harvey band. They have released two albums and have released a couple new singles including “Fallen Man’s Daughter” which they entered in the CBC Searchlight competition.They play the Slice, Feb. 15 at 9 p.m. Admission is $10. The Slice has something completely different on Saturday, Feb. 16 as they feature a local hip hop showcase featuring the Psychonauts, Loyal & T Blaze, Sammy & the Fiend, Pyke, xRGx &Cliche, Kropp hopper, Ty the Aboriginal, D.N.U.T and DJ Disko. Doors open at 8 p.m. There is a $10 cover. 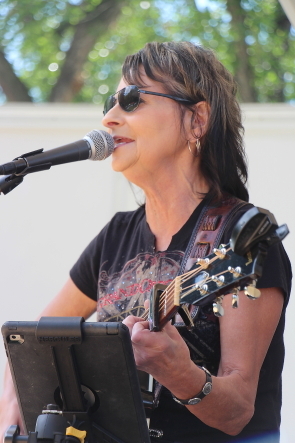 Local folk musician Karen Romanchuk has a busy week. She plays solo at Brick and Mortar, Feb. 14 for the Traveling Dress project, a new art exhibit featuring the work of 10 local photographers who photographed their own interpretation of the same dress.The event begins at 7 p.m. The Karen Romanchuk 3 also play the Watertown Friday and Saturday night. For Valentines Day, James Oldenburg and Paul Holden play for your supper at the Firestone Lounge, Feb. 14 from 6-9 p.m.
And Dale Ketcheson is playing classical guitar on Feb. 14 and 15 at the Mocha Cabana. And High River based country singer Bruce Peterson will be playing as Valentines Day Dance, Feb. 15 at the Lethbridge Legion. He plays the country music of the ’70s, ’80s and ’90s. Admission is $10 for members, $12 for non-members. Doors open at 6:30 p.m. The music goes until 11 p.m. It is also a good week for open mics. if you think you’re funny, test your best jokes at Good Times’ weekly comedy open mic, Thursday, Feb. 14. There is also an open mic at Thursday Thursdays at the Zoo at the U of L and at the Slice on Thursdays as well. Beaches always has an open mic on Wednesday nights and Honker‘s Pub has an evening open mic on Friday and their usual afternoon open mic on Saturday. 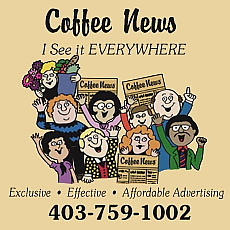 The Lethbridge Folk Club also has their monthly open mic at Casa at 7 p.m. on Friday. It is the second Friday of every month. It is also a good week to laugh, with amateur night at Good Times on Thursday. Good Times features magician Alan Sands on Friday and Surrey born, Fort McMurray based comedian Renee manners performing two shows on Saturday at 6 and 9:30 p.m. Admission is $10. DMTV returns to Club Didi on Saturday as local improvisors take on popular television shows. beginning at 9 p.m. There is a five dollar cover. The Owl Acoustic Lounge is hopping this week, especially on Saturday, Feb. 16 beginning with the LRGC family jam from 10-4 p.m. for followed by a matinee show from local bands Bring Your Own Bodies and Mercury beginning at 4 p.m.
Take a breather and get ready for Regina based math rock/ progressive rock band the Moon Runners and Calgary’s Crooked Spies. Admission is by donation.The night before, on Feb. 15, Local electonica musician Vandendool kicks off a mini tour with Fawns at the Owl Acoustic Lounge., Admission is by donation. Get your ’90s fix on at Casino Lethbridge as they welcome back local band Uncovered for Friday and Saturday. Just down the road, Suzanne Scott and the Dusty Rose band play KCs Pub,Feb. 16. Local rock band Dead Army has a special show at the Lethbridge Legion, Saturday, Feb. 16. They plus comedian Connor Christmas and musicians Ann Taylor and Nick Bohle are playing a special fundraiser for the Canadian Mental Health Association’s Youth Dreams Bursary.” There will also be a silent auction and raffle. Admission is $15 for the show, which begins at 7 p.m.